We hope you’ve enjoyed our Tailgating September food as much as we have. Here’s the last recipe, Grilled Garlic and Herb Shrimp, and I think Naomi saved the best for last. Her family absolutely love these lil bad boys and can chow down on these sweet little morsels of shrimp goodness. 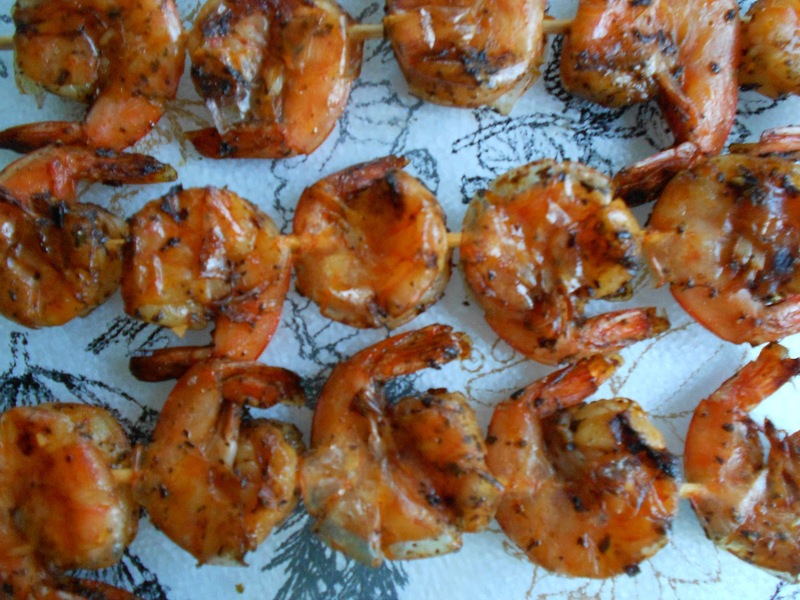 Various herbs, lemon juice and brown sugar make a spectacular marinade that the shrimp soak up like a sponge. Naomi says, Now, a note on the shrimp…You can use raw peeled shrimp. I have always been taught that it is better to cook shrimp on the grill with the shell still on and to peel at the meal. This is because shrimp can go from spectacular to rubber pretty dang quickly. The shell helps to buffer some of that time and give for mistakes. I have found in my years of cooking shrimp for this to be true. While I could probably use peeled shrimp at this time, I still continue to prefer the shell on. In my humble opinion, it keeps the shrimp “juicier”. It might be a tad messier and inconvenient, but I have just worked past that. Just have a bowl available to put the shells in and maybe some wetnaps for after the meal. I have served this several ways. A big bowl of them for sofa tailgating or with a crock pot baked potato or with a rice pilaf and salad. Your choice! 1) In a large pan or a container cover wooden skewers with water. Allow to soak for one hour. 2) Whisk together the first 8 ingredients and pour over shrimp. Stir to coat evenly and allow to marinade in the fridge for a minimum of 2 hours (I do 4 hours.). 3) Skewer shrimp onto skewers. I normally get 5 shrimp on each skewer. Be sure to leave spaces between each shrimp to ensure even cooking. 4) Place on grill of your choice. Try not to have them over direct heat. I let mine cook about 5 minutes each side. This is why it is important not to have them over direct heat!